Cannot read form information. Try reloading the page. I get the above message when I click on my submissions. It doesn't seem to care what form... Created a very small one for test and got the same message. I can't seem to replicate the error you're getting when I tried to open your account's submissions page. I used Mozilla Firefox 3.6.15 and IE 8 on my tests. Please ensure that you're using the latest stable version of the browser you're using and try again. Please let us know how it goes. I am using the same version of Firefox and IE. Could it possibly be because I use different Jotform logins for different customers? When I turn the site over to EcochicVintage, I want it to be theirs and want them to pay for additional usage etc. I did reboot my computer and cleared my browser cache after reading that answer for another user. I just checked it in Safari with the same result. I see. 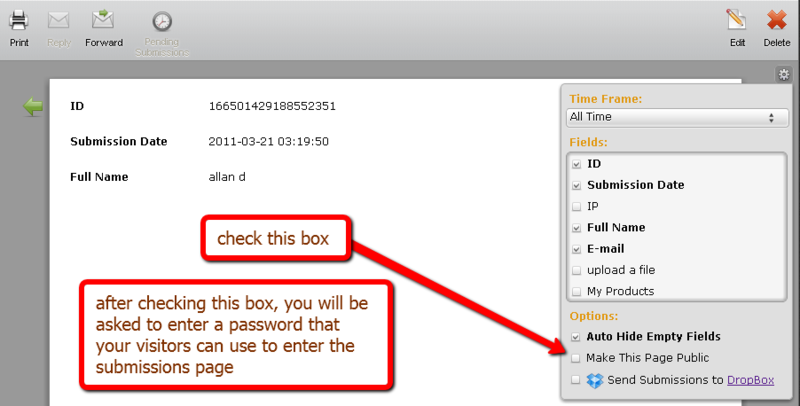 You can only read the submissions of forms belonging to the account you're currently logged in to. For example, you have accounts A and B, you won't be able to see account A's form submissions when you're logged in as account B, and vice versa. 3) Check the "Make this page public" box to make this form's submissions page public. 4) Enter a password. Your visitors will sue this password to gain access inside the page. 6) JotForm will provide the webpage URL that will be used to access the public submissions page. We hope you find this information useful. Thank you for using JotForm!